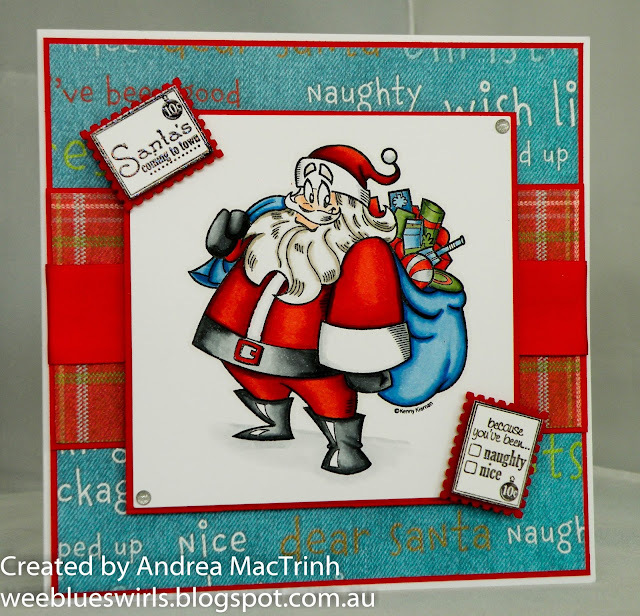 Wee Blue Swirls: Santa's Coming! I hope everyone has had a good week. Sorry I haven't been around this week, my crafting mojo left the building last weekend and I just haven't been able to put a card together - here's hoping I can get it back soon! Anyway today is the start of a new challenge over at Winter Wonderland. The theme this week is Santa Claus is Coming to Town! Our sponsor is offering three digis to the lucky winner. Fortunately I own quite a few Santa stamps and had a hard time deciding which one to choose for my card today! In the end I went with this jolly Santa from Kenny K and created a very simple, layered card. ABC Christmas Challenge - L for Lyrics - Santa Claus is coming to Town! Love your fab card, Andrea. Glad you chose that particular Santa stamp...he looks so cheeky! Your colouring is amazing.